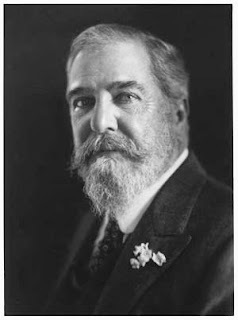 In 1880 Charles Tiffany, founder and principal owner of Tiffany & Co. jewelers, and his wife Harriet Olivia Avery Young were living in a luxurious home on Madison Avenue near 38th Street along with their daughter Louise. Their sons, Charles and Louis Comfort Tiffany had since moved out -- Louis and his family were living in an apartment building on 26th Street. Charles Tiffany, in 1882, decided to build a gigantic, multi-family home for the entire family. 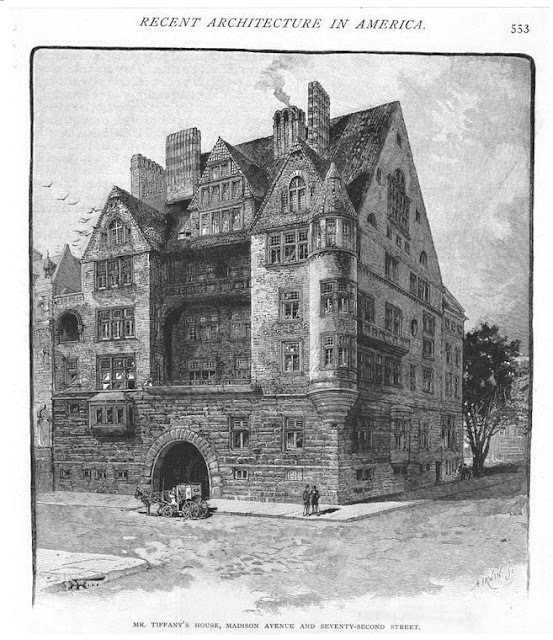 Land was purchased on the southwest corner of Madison Avenue and 72nd Street where other mansions were just beginning to rise. Although Charles apparently contacted the young architectural firm of McKim, Mead & White, it was Louis who quickly took over the project. Tiffany and Stanford White knew each other well. Four years earlier Tiffany and artist/decorator Lockwood de Forest had formed Louis Comfort Tiffany and Associated American Artists. Among the firm’s esteemed associates were Candace Wheeler, Samuel Colman and Stanford White. Tiffany presented White with a preliminary sketch – a mammoth Romanesque structure with turrets and arches, balconies and gables. The house was to be, actually, three separate homes in one. Charles and Harriet were to have the first and second floors, the unmarried Louise would take up the third floor, and Louis would have the fourth and fifth floors. Most likely because of Tiffany’s relationship with White, the firm allowed him to essentially take control. Charles Tiffany had nearly unlimited funds to make his son’s vision become reality. In no other commission would McKim, Mead & White so nearly completely relinquish the design of a building – at least in its basic size and appearance – to its client. White was successful, however, in diluting the heaviness of Tiffany’s sketches by substituting beige, speckled brick for stone. The brick, formulated by White, was produced by the Perth Amboy Terra Cotta Company and became known as Tiffany brick. He additionally softened the heavy medieval feeling by adding triple Palladian windows to the south gables and including “Colonial” features. Tiffany’s wife, Mary Woodbridge Goddard, died the year before the house was finished. The widowed artist would move into the mansion in 1885 with his two sons and two daughters. When completed the monumental 57-room house dominated the nearly-empty neighborhood. An immense stone arch served as the entrance with an ornate metal fence-like gate that could be raised and lowered. Visitors pulling up in their carriages could step directly onto a stone “pulpit” without the inconvenience of stepping down to the pavement. Charles Tiffany disliked his finished space and never lived in the new mansion, opting instead to stay in the house 30 blocks south. 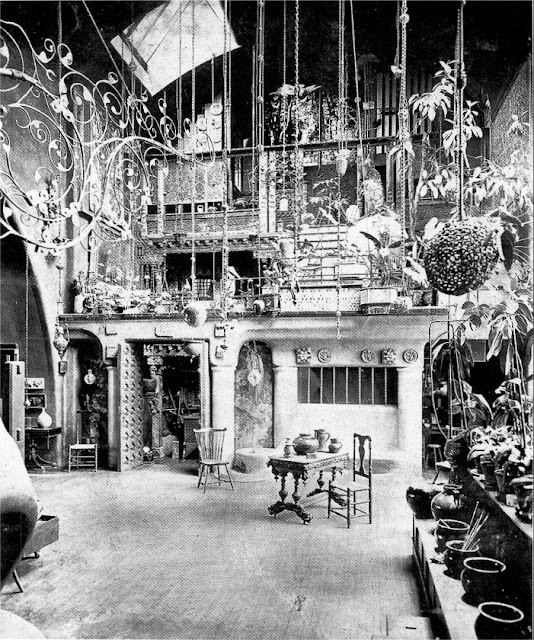 Louis Tiffany’s colossal duplex included his studio – a soaring space 45-feet high, actually about three stories in height. The focal point of the magical room was a great, central fireplace with four openings, in the form of an art nouveau tree trunk. From the open rafters hung a hodgepodge of brasses, ironwork and decorative glassware; while palms and exotic plans appeared to sprout from the corners. Later, in 1902 a large Aeolian organ would be installed in a balcony here with a console case designed by Tiffany himself. Associates Artists helped decorate the mansion. 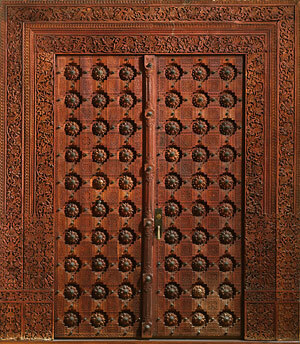 Intricate teakwood panels carved in India were imported by de Forest, who would later slather his own house on East 10th Street with similar carvings. The rooms were highly disparate – some nearly Spartan in their design; others dripping with art nouveau ornament. A year after moving in, Tiffany married Louise Wakeman Knox. The couple would add a son and three daughters to the large family. Like Mrs. Villard, the new Mrs. Tiffany was active in charity work and, with the help of her husband, transformed his studio into a Japanese garden on November 8, 1889. In a fund raising effort for the New York Infirmary for Women and Children, a chrysanthemum show was staged. Terraces were constructed for the thousands of potted flowers – one of which was valued at $1,500 by its owner – and society women were clad in embroidered Japanese gowns. Japanese lanterns hung from the ceiling, an orchestra played from behind rare hangings and flowers, and a brazier filled the studio with the aroma of Japanese scentsticks. 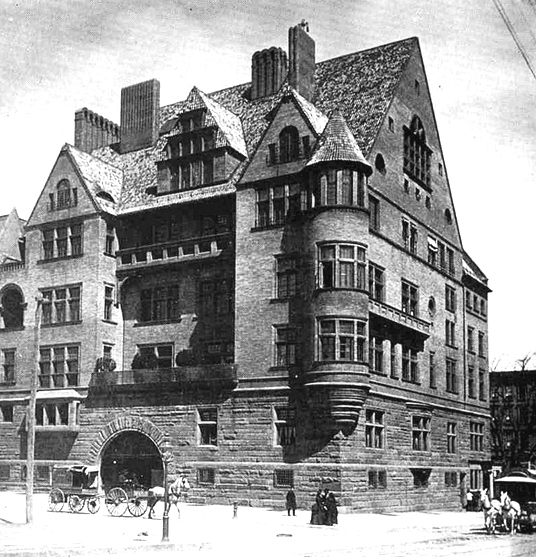 In 1907 John H. Matthews and his family were leasing the Villard apartments. On April 3 of that year, the Matthews’ daughter Eulalie was married in the drawing room “which was decorated with flowers and palms,” according to The Times. After nearly a half century in the house, Louis Comfort Tiffany died here in 1933. Three years later the family sold the house to a developer and the unique mansion was demolished to make way for a modern apartment building; certainly one of the most lamentable losses in the city’s history. NYC hasn't learned from its past mistakes. It's still destroying the treasures of our past; developers only care about how much money can be made. The irreplaceable is lost forever. Some of the items from this house are in the Charles Hosmer Morse Museum in Winter Park. Go see it. You won't be disappointed. I houses the largest Louis Comfort Tiffany collection in the world. So sad, and so many other gems that have been demolished in the past.